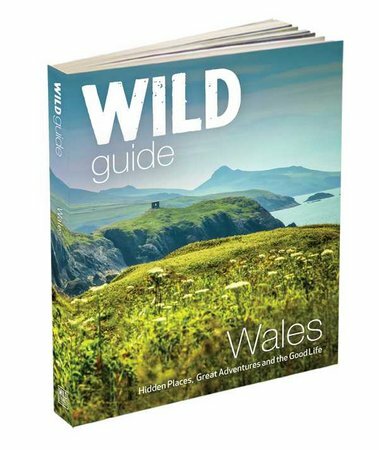 Daniel Start’s new compendium of adventures to Wales, from the best-selling Wild Guide series, contains over 1000 hidden places, and publishes on 1st May. Here he picks seven amazing natural wonders that very few people even know about. 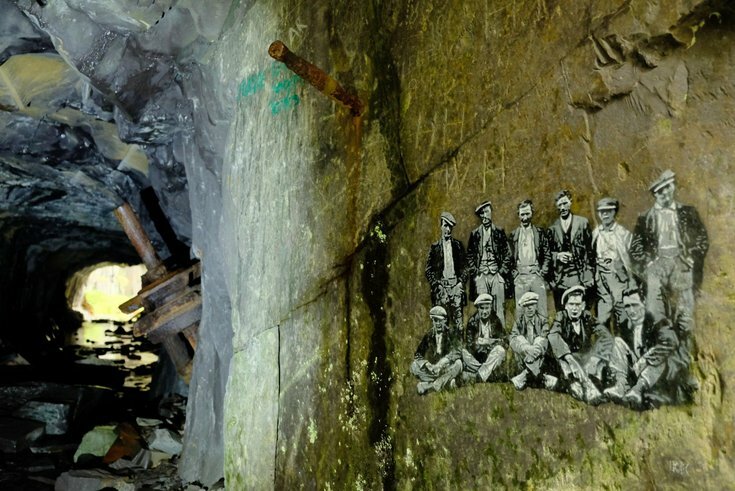 Centuries of slate mining have left extraordinary features all over the Welsh landscape. Magnificent Dinorwig consumed an entire mountainside above lake Padarn. At its peak it employed 3,000 men on over 30 levels, creating pits over 250m deep. With names such as California, Australia and Tasmania. The rite of passage is the ‘snakes and ladders’, an extraordinary route between the various pits accessed via climbing rockwalls on old iron ladders and descending through tunnels into the Lost World. In places – such as the huge shed with 100 circular saw tables, or a caban where workmen’s coats still lie waiting – time stands still. Take care if you enter these sites, as each winter frost sees another collapse. Access issues also flare up here from time to time, so be respectful. Much used by climbers, but mostly private land, so be respectful and discreet. Dali’s Hole is a transient blue lake with waterfalls, empty in dry weather. From here explore through the waterfall double tunnel into ‘California’ with its giant snake chain and Banksy-style grafitti art by ‘Panik’ (Jack Murray). Wales has the most exciting coast in Britain. 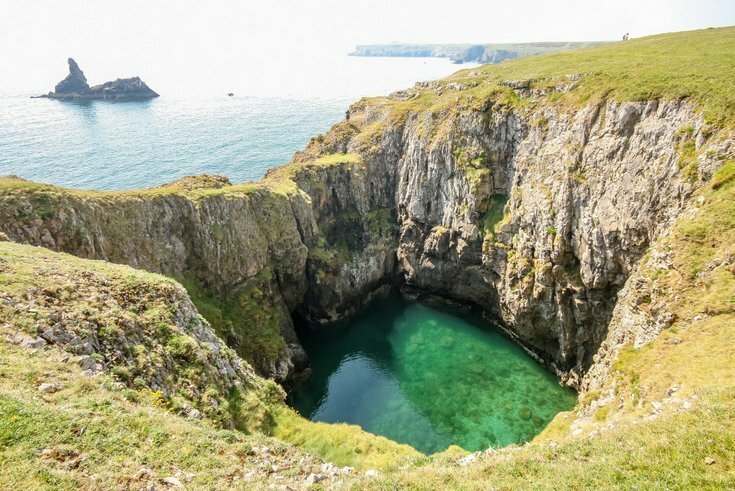 In particular, the limestone coast of southern Pembrokeshire is pitted with caves and arches. None more s than along the coastline below the Blue Crater. 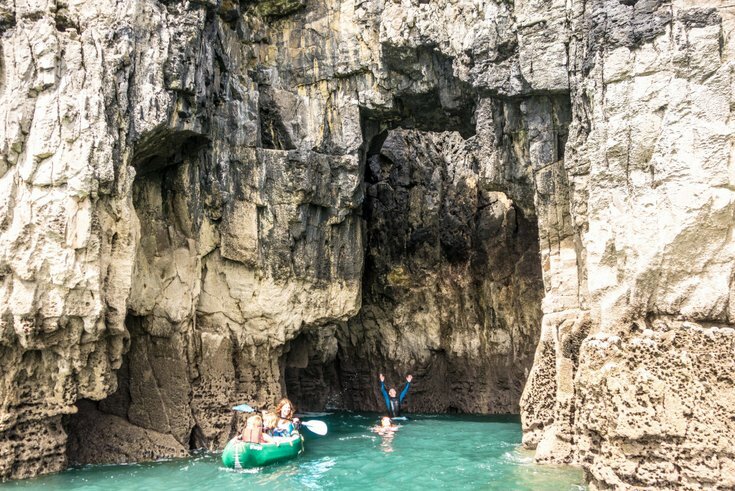 Here a cavern has collapsed into a huge blue crater that fills with water at high tide, accessible to the adventurous from about mid-tide and below. You can swim on a little further for more blowholes, including a chimney known to climbers as Confucius Hole, and eventually into Box Bay (also called Saddle Bay, not named on maps), a steep-backed Robinson Crusoe beach with more sea caves. 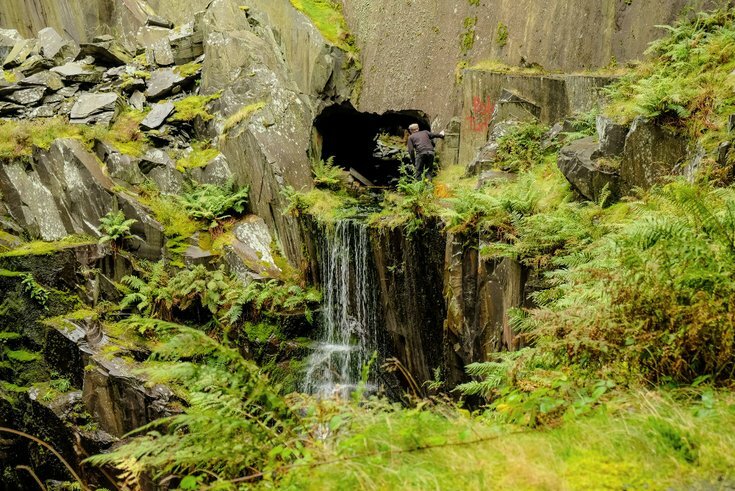 Rain has cut extraordinary rock formations and gorges into the mountains in Wales. 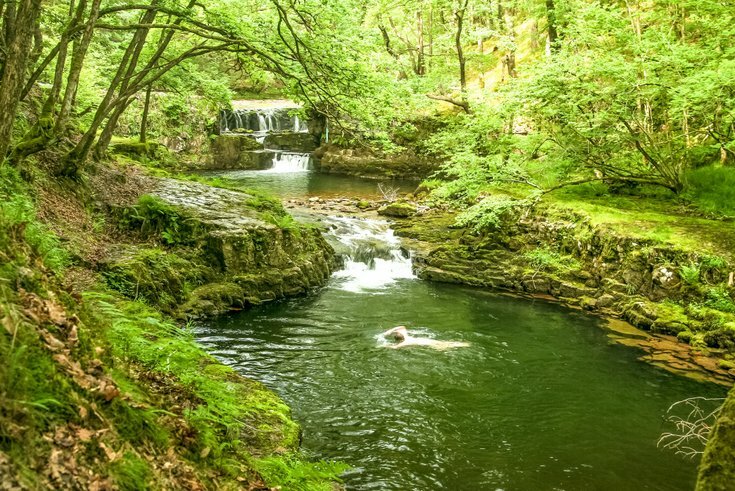 Coed y Rhaiadr, literally the ‘waterfall woods’, are the sublime handiwork of the Mellte and Nedd rivers meeting contorted seams of limestone, sandstone and gritstone, and you’ll not find a more impressive network of forest lidos and falling water anywhere in Britain. There are canyons to swim through, waterfalls you can climb behind and emerald-azure pools nestled in great moss- and fern-bound amphitheatres. In the higher reaches whole sections of river flow underground through great river caves, in one part leaving a dry river canyon that last felt water flowing an ice age ago. The waters re-emerge through further mysterious caves, such as White Lady cave in the Nedd valley. In the lower reaches, river flows were harnessed to grind gunpowder and mine silica at Craig y Ddinas. Wales was home to some of Britain’s first settlers. 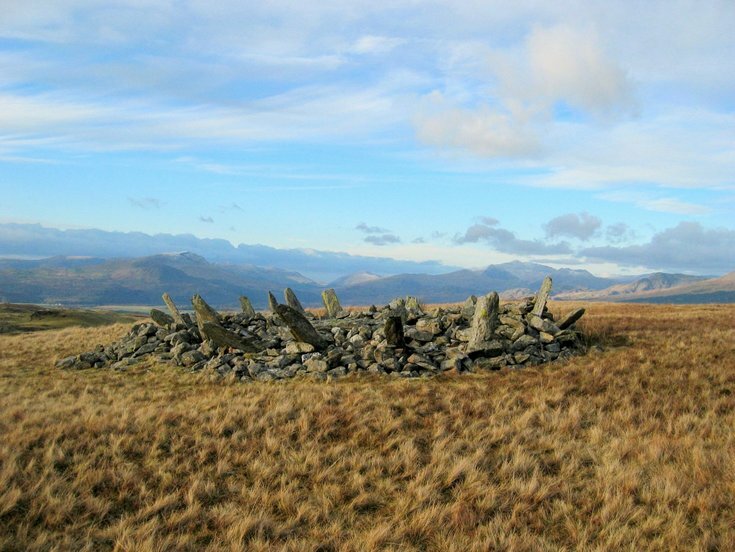 Up among the heather and golden grasses of the Rhinogs are an abundance of Bronze Age sites and a prehistoric trackway – now christened the Ardudwy Way – once linked Ireland and Britain via the natural harbours of the coast. Bryn Cader Faner is one of the most spectacular stone circles in Britain, actually a Prince’s burial cairn, well over 4,000 year old. Only 18 stones remain standing, damaged by treasure hunters and by soldiers during WW2 who used them for target practice. They sit proud like a crown of thorns. 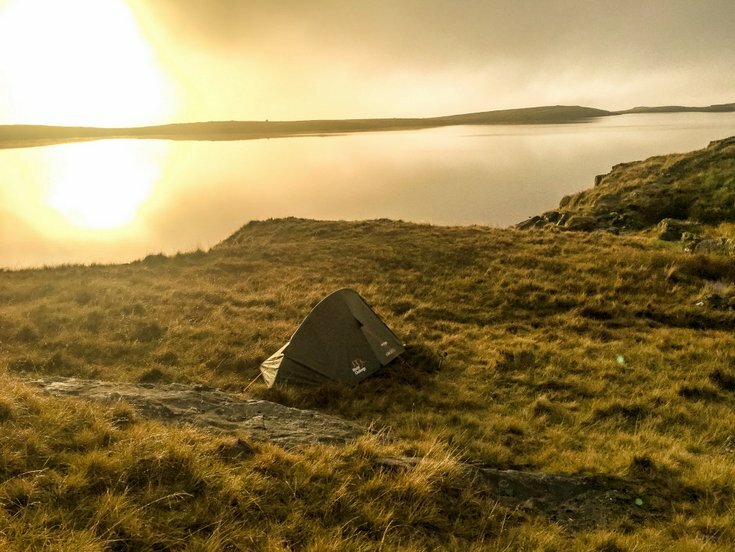 The wild setting among many lakes and under Moel Ysgyfarnogod, or ‘hare mountain’, only adds to the experience. Some of the yew trees of Wales are said to predate the Christian sites on which churches were first founded in the 5th century. Missionary saints often brought their message to existing sacred sites marked by yew circles. 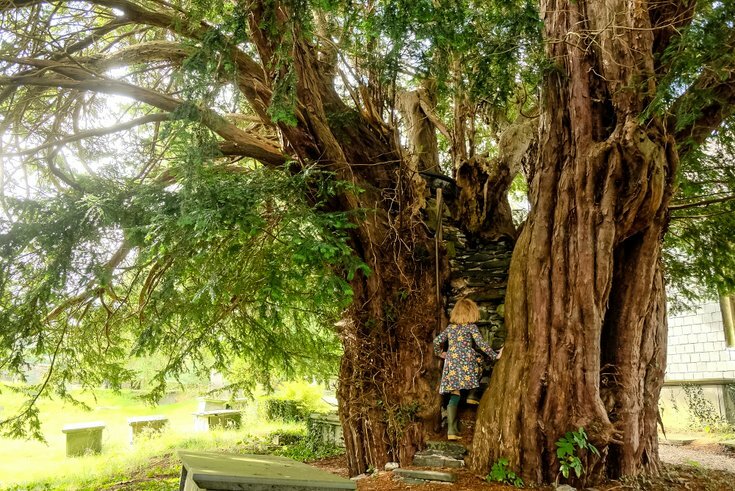 There are many such millennia old yew but at Nantglyn a stone pulpit and steps have been built into the yew’s hollow trunk and tree is said to be as much as 2000 years old. John Wesley, the founder of Methodism, is said to have preached from here. 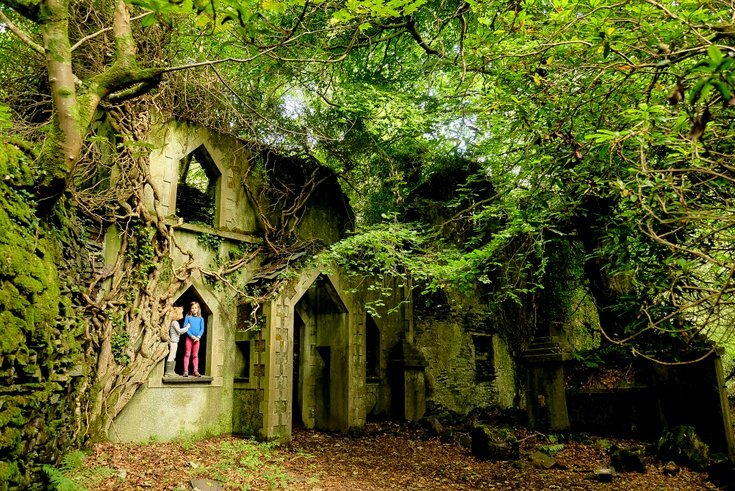 A vast, wild site with many fascinating overgrown ruins, like a Welsh Angkor Wat. From entrance bear left on footpath for ruined Talysarn Hall and barracks at 53.0559, -4.2439. Circumnavigate the lake to discover old railways and a beam pump house. The lake is over 100m deep in places, the lake is the culmination of many flooded quarry pits. Swimmers are welcome at the diving pontoon, at the end of a rough vehicle track. Currently open to the public, but development plans afoot. during his rule). 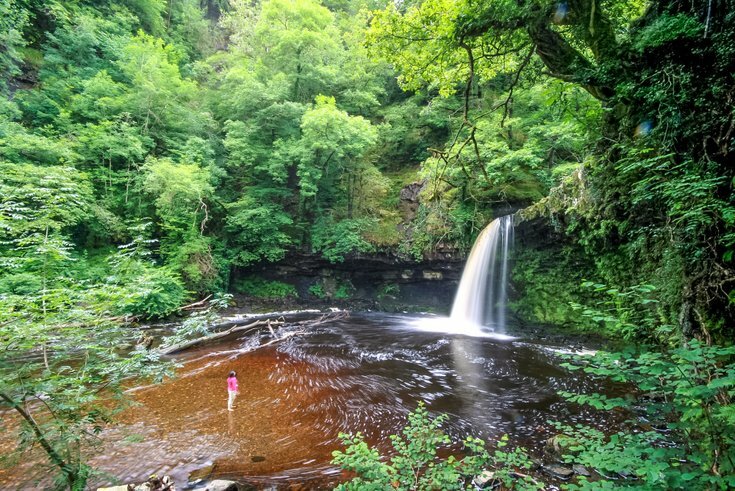 Beware, the water is freezing – legend has it the saint’s penance was to stand in it! The vast empty ‘green desert’ of the Cambrians, the middle section of Wales, is as wild as anywhere is Scotland. 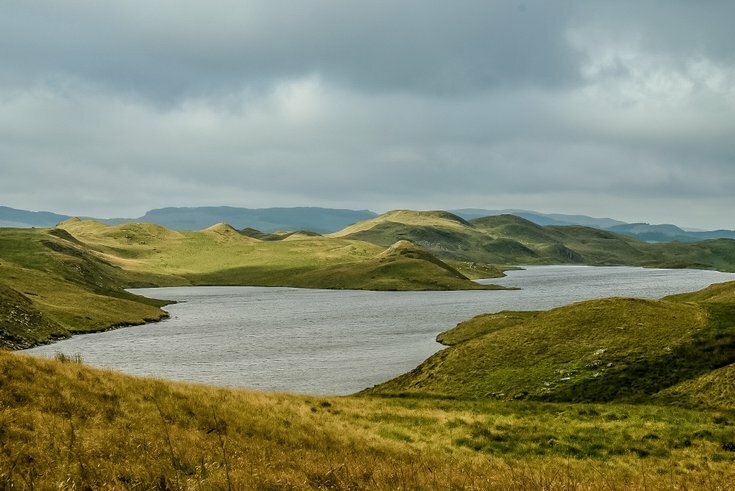 With easy access and stunning southerly views, this remote family of high lakes makes for a sublime adventure on a sunny day. Together they form the headwaters of the River Teifi at the start of its journey to Cardigan Bay. Tracks lead off to most of the lakes, and if nobody is fishing, a swim and wild camp shouldn’t be an issue. Egnant is the last lake and has a track right along its shore. Llyn Bach is hidden beyond, only a little way on foot. Daniel Start has lived in and explored Wales and its Marches for many decades. He is an award-winning travel writer and photographer and author of best-selling Wild Swimming, Wild Guide and Hidden Beaches. Tania Pascoe is a naturalist and foodie, author of Wild Garden Weekends and several Wild Guides. Wild Guide Wales and the Marches: Hidden Places, Great Adventures and the Good Life (publishing 1st May 2018, Wild Things Publishing, £16.99).